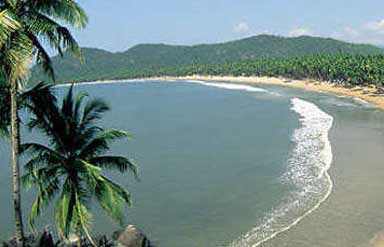 Palolem Beach offers both relaxation and adventure holidays to tourists who come here from several parts of the globe. 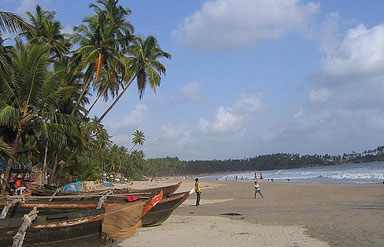 This beautiful beach is located about 2 km West of Chaudi in Canacona District, South Goa. This crescent shape beach is famous for its juxtaposed beauty of azure sea, silver sand and swaying coconut palms trees. The blended features of these make it a picturesque beach where tourists come to enjoy their holiday amidst serene and scenic ambiances. This pristine beach is inhabited mostly by the fishermen and foreign tourists who live in the shacks along the shore. At this beach, one can also go out on the marine waters to spot dolphins. At the northern end of the beach is a freshwater stream. Across this stream is a tiny, undeveloped island that can be accessed by just swimming across during low tide. However, it is not safe to do so during high tide. Scores of tourists visit this tiny island to experience the best of nature’s beauty speckled in the form of sea, sun and sand. The other attractions on this beach are the Dolphin cruises and the fishing trips. These are offered at reasonable rates for tourists. This beach is about a mile long and its seclusion and idyllic scenery make it a hot spot for tourists. There are small shops around the Palolem beach that sell beach wear, souvenirs, seafood snacks and sarongs. Several accommodation options are scattered around the beach, including guesthouses and beach huts. 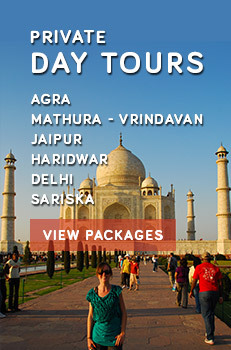 Caper Travel India offers wide a range of Tour Packages to Goa. For details please enter your query in the form provided below.